Echo Dot (2nd Generation) is a hands-free, voice-controlled device that uses Alexa to play music, control smart home devices, make calls, send and receive messages, provide information, read the news, set alarms, read audiobooks from Audible. Connects to speakers or headphones through Bluetooth or 3.5 mm stereo cable to play music from Amazon Music, Spotify, Pandora, iHeartRadio, and TuneIn. Introducing Alexa calling and messaging, a new way to be together with family and friends. Just ask Alexa to call or message anyone with an Echo, Echo Dot, or the Alexa App. Controls lights, fans, switches, thermostats, garage doors, sprinklers, locks, and more with compatible connected devices from WeMo, Philips Hue, Samsung SmartThings, Nest, ecobee, and others. Hears you from across the room with 7 far-field microphones for hands-free control, even in noisy environments or while playing music. 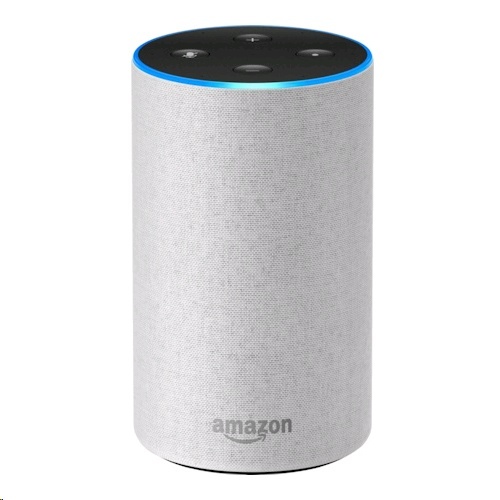 Includes a built-in speaker so it can work on its own as a smart alarm clock in the bedroom, an assistant in the kitchen, or anywhere you might want a voice-controlled computer; Amazon Echo is not required to use Echo Dot.